Living from the seated position, any horizontal surface, at our level, becomes fair game for clutter. Sadly, that is the fate of the work table. No matter how I try to organize it, clutter is always attracted to its surface. After several months of neglect and without anything else too urgent demands my attention today, I figured a lazy Saturday was a good time to tackle the task. With some shredding, recycling and piling to be filed and assistance from Darrell, the desk top began appearing. Obviously, progress was being made. Time for some lunch! Sitting here at my desk, eating macaroni and cheese, while watching my peepsâ€™ chatter on Twitter â€“ what a way to spend part of a lazy Saturday afternoon! Big night of writing and prep work, not to mention catching up. This is how I get it done, gang. ABC: always be creating. His next tweet, curtsey of Rosa Say, is â€œDEFG: Dream, Evangelize, Follow-up Generouslyâ€. I follow with HIJ: Hope, Inspiration and Justice. Chris offers HIJ: Hide in Jammies! I like his thinking. KLM: Keep Living Meaningfully comes to my mind. NOP: Need Oxygen Permanently naturally follows, based on first-hand experience! Virtual Assistant guru Stacy Brice tweets QRS: Quit Reaping Stupidity! I invite you to finish singing Twitterâ€™s Alphabet Song, while I go finish what I started earlier. Isnâ€™t playing game and singing with friends what lazy Saturday afternoons are for?! What fun on a summer Saturday afternoon/evening! Loved your post and realized that since I can stand and walk around with hands and arms that work well, I have no excuse for the mess on my desk! 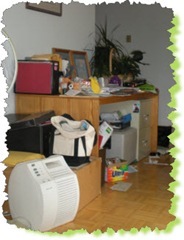 I am motivated to turn the mess into a more managable little mess. 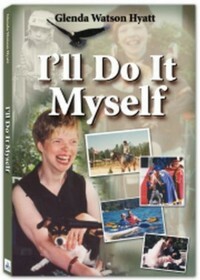 If you can, I can too! Then, I’ll get back to Twitter! @ChrisBrogan is the one who told me about you!